Last week we took a look at Nebraska's receivers courtesy of Bill Connelly's marginal efficiency and marginal explosiveness metrics. The general idea is to measure efficiency and explosiveness for plays featuring individual players against the expected numbers based on down, distance and field position. This week Connelly made his rushing numbers available. You can get a more in-depth explanation of the calculations there if you want one. 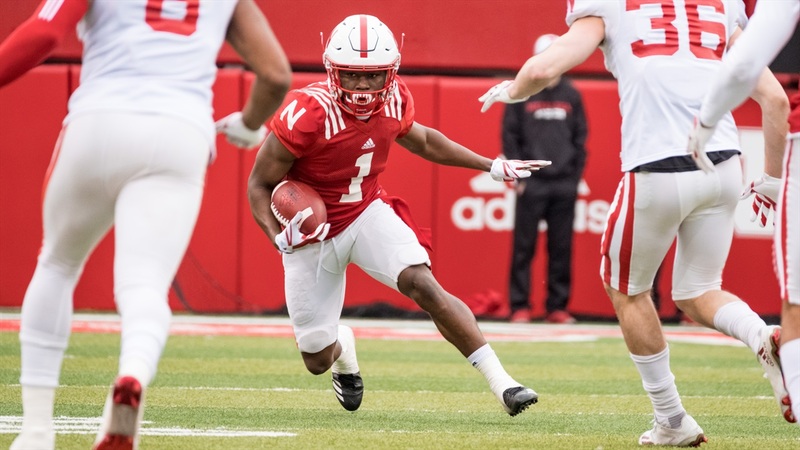 I characterized the wide receiver numbers, at least for Stanley Morgan Jr. and JD Spielman, as good but maybe not as good as you would've thought based on the totals they put up. That's a good thing for Nebraska in 2018 as there's still room to improve. The rushing numbers? They're about as rough as you remember. These stats are available for any player with a rushing attempt, but for the 2017 Huskers there were only four players with 20-plus attempts, all running backs. Of the Huskers' four backs, Tre Bryant was easily the most efficient and he did it in slightly tougher circumstances, too. We're not talking about circumstances stemming from a "tricky knee" here, but when and where he got the ball during the six quarters (but 51 attempts!) he got in 2017. Nebraska's expected success rate on Bryant carries was 40.6 percent, but he produced a success rate on those plays of 49 percent for a marginal efficiency of 8.4. Translation: Bryant carries had a positive effect on Nebraska's offensive efficiency. Wilbon (88 carries) had the highest-quality opportunities based on success rate and the "best" marginal efficiency of the running backs not named Bryant. Ozigbo (129 carries) and Bradley (24 carries) had about the same quality of chances, but produced successful plays less often than Wilbon (drastically so in the case of Bradley, though the sample size is small). If you go to the data set and look at the marginal explosiveness numbers don't be alarmed when you see a bunch of negative numbers. That's pretty standard for rushing attempts. Big plays are fewer on the ground and it's thus harder to really change the offense's expected points –– how this is measured –– on a play-by-play basis. But those numbers do somewhat reinforce what your eyes were probably telling you (if you squinted through many failed runs to see the good ones): Wilbon and Bradley were Nebraska's most explosive backs, relatively speaking. They also led the Husker backs in highlight yards –– how many yards were gained beyond 5 yards on all runs that gained at least 5 yards i.e. an 11-yard run results in 6 "highlight yards" for the ballcarrier –– though Spielman had the best average on the team, albeit on just 10 carries. In case you're curious about what these same numbers looked like for UCF in 2017, the Knights had six players with 20-plus rushes including quarterback McKenzie Milton and Duck-R hybrid Otis Anderson. Two of them had a positive marginal efficiency. Milton led the way at 18.7 percent on 97 carries. Greg McCrae, UCF's Jaylin Bradley in terms of carries, was at 3.2 percent. Adrian Killins was flat at zero percent. His carries were exactly as efficient as expected. But Killins and Anderson both produced positive marginal explosiveness, which, as mentioned above, is hard to do. Anderson's marginal explosiveness was insanely good at 0.48 on 70 carries. If you limit the list to players with 50 rushes or more (a pretty low threshold, but it gets rid of guys who had a few big runs on a few carries) Anderson's marginal explosiveness ranked third in the country behind Arizona quarterback Khalil Tate (0.68) and Stanford running back Bryce Love (0.63). Not bad company to keep, particularly for a player listed as a wide receiver. So I'll ask again: How many games in 2018 for Spielman and Lindsey to eclipse 10 and seven carries respectively? Scott Frost comes in third in this ranking of Big Ten coaches. Nebraska volleyball is officially the preseason favorite in the Big Ten. Also, the Lo-Down is back for a new season. Here's the Fan Day information you need ahead of Saturday. ICYMI: So much from yesterday. Go here and you can find Frost on the Jim Rome Show, the competition at nickelback, DC Erik Chinander on Sunday's scrimmage and more.